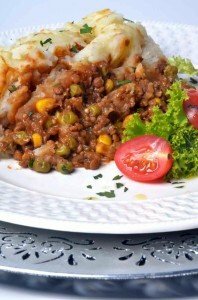 A simple, heart warming recipe for lentil cottage pie. Comfort food that will bring back memories of your Mom’s home cooking. Peel and cube the potatoes and add to salted boiling water in a large pot on the stove. Boil until potatoes are soft. Once soft, drain in a colander. Transfer back to the pot, add the knob of margarine with some water and the salt and pepper. Mash until smooth and fluffy. Set one side for later use. Peel and dice the onion, sauté in a large pot with a little olive oil over a medium heat. Add the garlic and continue to fry lightly for a few minutes. Add the tinned chopped tomatoes and cook on a medium heat until the tomatoes are soft and saucy. Add the tinned lentils in their brine followed by the frozen veg, salt and pepper. Bring to the boil, add a little more water if needed. Mix the gravy powder separately with a little cold water to form a thin paste. Slowly add to the pot while stirring constantly. This should create a rich gravy. Remember, the filling will thicken while baking. 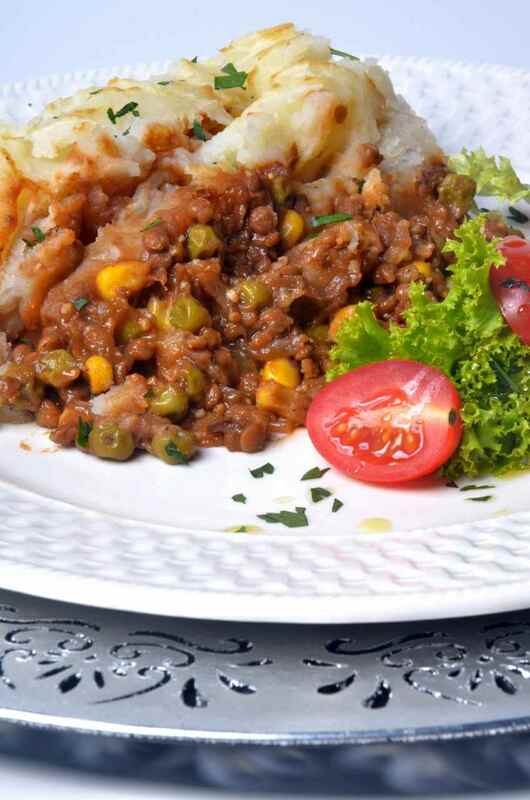 Transfer filling to a greased oven-proof dish, carefully top with the mash, smoothing it out with the back of a spoon. Run a fork along the top of the mash to create a ridge affect. Place on the middle shelf of the oven for 20 minutes until the mash starts to brown slightly. Remove and allow to stand for a while before serving with a side salad.